The treatment of hazardous fuels is one of the most proactive ways to reduce potential loss of life and property in the event of a wildland fire. By following Firewise™ practices, creating defensible space, and treating fuels, you can lower your fire risk while increasing the chances that fire protection agencies can effectively deal with a wildland fire should it occur. Cost- share funding is available now in some areas to help landowners with the cost of reducing their hazardous fuels. HOW DOES THE COST-SHARE PROGRAM WORK? 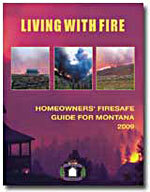 North Fork Landowners’ Association Fire Mitigation Committee (Home Evaluation Application). • On receipt of the initial contact form, one of our Community Foresters will make an appointment to visit your property and discuss your wildfire mitigation concerns with you. The forester will recommend an appropriate treatment, prepare a cost estimate, and explain the cost-share guidelines. Recommendations generally involve thinning and pruning of trees and disposal of woody fuels. General forest health issues also will be discussed. There is no charge for this site evaluation. • If you decide you want to proceed with the recommended treatment, the forester will draft a project agreement specifying the work to be performed and other terms and conditions, including cost-share requirements. • You will then be responsible for completing the work − doing it yourself, hiring a professional contractor, or some combination thereof. If you request it, the forester can provide a list of contractors who have indicated an interest in doing such projects. Inclusion on the list does not constitute an endorsement of any listed contractor or his/her qualifications and experience. Getting competitive bids, checking references, and looking at previous work done by any contractors you are considering employing is highly recommended. For your own protection, you should (at a minimum) make sure that the contractor you hire has full and proper liability insurance and workers compensation coverage. • After you have selected a contractor and before s/he has begun work on your project, a meeting should be arranged among you, the forester, and the contractor, so that there is a shared understanding among all parties of the work to be performed and the specifications to be met. If questions regarding the treatment prescription arise, or if unexpected events or conditions are encountered while work is on-going, the forester should be notified immediately so that any necessary clarification or modification of the project agreement can be made. • When work on the project has been completed, you will need to request an on-site inspection by the forester, who will either verify that the agreed-upon work has been completed according to the specifications in the project agreement or will identify incomplete work items that need further attention. When all work has been satisfactorily completed, you and the forester will both sign a project completion form. • You may satisfy your cost-share requirement in cash or in-kind, or in some combination of the two. In-kind contributions include the value of work that landowners do themselves as part of their projects (examples, limbing, piling, brush removal). Some projects may require the removal of sawlog-size trees, although grant funds cannot pay for such removal. However, contract work obtained in exchange for those trees can be used as part of the landowner’s cost-share requirement. • When the project completion form, together with satisfactory documentation showing you have met your cost-share requirement (a signed receipt from your contractor showing that s/he has been paid by you) is received by FEPC’s Northwest Montana Hazardous Fuels office, a cost-share reimbursement check will be issued. WHAT WILL MY PROPERTY LOOK LIKE WHEN THE WORK IS COMPLETED? • Each property will have its own unique look. The underlying intent, however, is to space trees so that fire will not spread from crown to crown and a fire on the ground will not climb into the crowns. • Generally the work involves thinning, pruning, and slash disposal. Trees will be thinned so that there is 10 feet between the crowns. Tree trunks may be 12 to 20 feet apart, depending upon their size. Lower tree branches will be removed 8 to 10 feet above ground level. Woody fuels on the ground and slash greater than two inches in diameter will be disposed of through burning, chipping or mulching on-site, removed from the property, or some combination thereof. • Looking at other properties where thinning and other hazardous fuels treatments have been conducted may be helpful to you in visualizing the post-treatment appearance. The forester also may have some "before" and "after" pictures from previously completed projects.